California Pottery Collectors this is for you! A rare and very early pre-Vernon Kilns dish marked, "Poxon China, Vernon, California". Poxton China of Vernon, CA was purchased by Vernon Kilns in 1931. 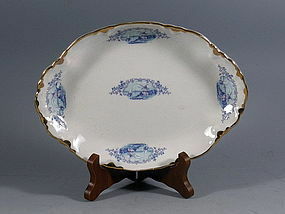 Decorated in blue transferware featuring a peaceful scene with a sailboat and windmill, the dish is trimmed in gold showing little or no wear. There is some expected minor crackling indicative of age, most visible on the underside. Considered to be in excellent antique condition with no chips, no cracks, no hairlines, it measures 9" x 6.5" x 1"